There are few instruments as versatile as the guitar. You can find it in nearly any genre and in any crevasse of the world. That versatility can be both useful and entertaining, though it can also feel overwhelming. The goal of this site is to foster a greater connection amongst guitarists from all styles and genres that have interest in broadening their creative and technical musical pursuits. …and there’s always time and space for a little nonsense here and there. Sean Thrower is a guitarist with interest and versatility in an eclectic mix of playing styles and genres, which has led him to perform in a wide variety of settings and venues. He holds both a Bachelor’s and a Master’s degree in music performance from the University of Georgia where he studied classical guitar under renowned pedagogue, John Sutherland (a protégé of Andrés Segovia). While in school, Sean had an assistantship and taught guitar methods courses at UGA. He also performed in masterclasses for several Grammy winning artists including David Russell, Jason Vieaux, Pepe Romero, and Sheron Isbin. Other notable classical guitar performances include solo guitarist with the UGA Symphony Orchestra and combined choirs, guitarist for the UGA Men’s Varsity Singers, and soloist with the Rome Symphony Orchestra. As singer/songwriter/guitarist, Sean performs with his modern acoustic duo, Terminus Falls. Their first album “Getting Lost” was released in March 2016 through Curvepoint Media. 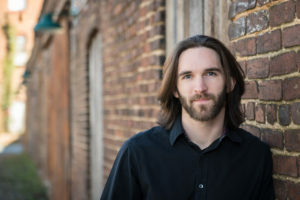 Sean is also an author and composer with two published guitar method books. Traversing the Fretboard was released in 2016 and is a method for organizing chords and scales through Sean’s own approach of the CAGED System. The Segovia Scales is a re-illustration of Andres Segovia’s Diatonic Major and Minor Scales in a manner that is both easier to read and quicker to learn with an added section on practice techniques. As a teacher, Sean has taught many students through his own studio and various institutions. In 2015, he founded the Rome Guitar Institute in Rome, Georgia, where he has instructed students of all ages on electric, acoustic, and classical guitar, as well as bass guitar, ukulele, and mandolin. Currently, he is on staff as Artist Affiliate at Berry College and as Adjunct Professor of Guitar at Dalton State College.